Study long-term charts. Begin a chart analysis with monthly and weekly charts spanning several years. A larger scale "map of the market" provides more visibility and a better long-term perspective on a market. Once the long-term has been established, then consult daily and intra-day charts. A short-term market view alone can often be deceptive. Even if you only trade the very short term, you will do better if you're trading in the same direction as the intermediate and longer term trends. Determine the trend and follow it. Market trends come in many sizes -- long-term, intermediate-term and short-term. First, determine which one you're going to trade and use the appropriate chart. Make sure you trade in the direction of that trend. Buy dips if the trend is up. Sell rallies if the trend is down. If you're trading the intermediate trend, use daily and weekly charts. If you're day trading, use daily and intra-day charts. But in each case, let the longer range chart determine the trend, and then use the shorter term chart for timing. Find support and resistance levels. The best place to buy a market is near support levels. That support is usually a previous reaction low. The best place to sell a market is near resistance levels. Resistance is usually a previous peak. After a resistance peak has been broken, it will usually provide support on subsequent pullbacks. In other words, the old "high" becomes the new "low." In the same way, when a support level has been broken, it will usually produce selling on subsequent rallies -- the old "low" can become the new "high." Measure percentage retracements. Market corrections up or down usually retrace a significant portion of the previous trend. You can measure the corrections in an existing trend in simple percentages. A fifty percent retracement of a prior trend is most common. A minimum retracement is usually one-third of the prior trend. The maximum retracement is usually two-thirds. Fibonacci retracements of 38% and 62% are also worth watching. During a pullback in an uptrend, therefore, initial buy points are in the 33-38% retracement area. Draw trend lines. Trend lines are one of the simplest and most effective charting tools. All you need is a straight edge and two points on the chart. Up trend lines are drawn along two successive lows. Down trend lines are drawn along two successive peaks. Prices will often pull back to trend lines before resuming their trend. The breaking of trend lines usually signals a change in trend. A valid trend line should be touched at least three times. The longer a trend line has been in effect, and the more times it has been tested, the more important it becomes. Follow moving averages. Moving averages provide objective buy and sell signals. They tell you if existing trend is still in motion and help confirm a trend change. Moving averages do not tell you in advance, however, that a trend change is imminent. A combination chart of two moving averages is the most popular way of finding trading signals. Some popular futures combinations are 4- and 9-day moving averages, 9- and 18-day, 5- and 20-day. Signals are given when the shorter average line crosses the longer. Price crossings above and below a 40-day moving average also provide good trading signals. Since moving average chart lines are trend-following indicators, they work best in a trending market. Track oscillators. Oscillators help identify overbought and oversold markets. While moving averages offer confirmation of a market trend change, oscillators often help warn us in advance that a market has rallied or fallen too far and will soon turn. Two of the most popular are the Relative Strength Index (RSI) and Stochastics. They both work on a scale of 0 to 100. With the RSI, readings over 70 are overbought while readings below 30 are oversold. The overbought and oversold values for Stochastics are 80 and 20. Most traders use 14-days or weeks for stochastics and either 9 or 14 days or weeks for RSI. Oscillator divergences often warn of market turns. These tools work best in a trading market range. Weekly signals can be used as filters on daily signals. Daily signals can be used as filters for intra-day charts. Trade MACD. The Moving Average Convergence Divergence (MACD) indicator (developed by Gerald Appel) combines a moving average crossover system with the overbought/oversold elements of an oscillator. A buy signal occurs when the faster line crosses above the slower and both lines are below zero. A sell signal takes place when the faster line crosses below the slower from above the zero line. Weekly signals take precedence over daily signals. An MACD histogram plots the difference between the two lines and gives even earlier warnings of trend changes. It's called a "histogram" because vertical bars are used to show the difference between the two lines on the chart. Use ADX. The Average Directional Movement Index (ADX) line helps determine whether a market is in a trending or a trading phase. It measures the degree of trend or direction in the market. A rising ADX line suggests the presence of a strong trend. A falling ADX line suggests the presence of a trading market and the absence of a trend. A rising ADX line favors moving averages; a falling ADX favors oscillators. By plotting the direction of the ADX line, the trader is able to determine which trading style and which set of indicators are most suitable for the current market environment. Include volume and open interest. Volume and open interest are important confirming indicators in futures markets. Volume precedes price. It's important to ensure that heavier volume is taking place in the direction of the prevailing trend. In an uptrend, heavier volume should be seen on up days. Rising open interest confirms that new money is supporting the prevailing trend. Declining open interest is often a warning that the trend is near completion. A solid price uptrend should be accompanied by rising volume and rising open interest. Technical analysis is a skill that improves with experience and study. Always be a student and keep learning. يجب ان تحدد الاتجاهات: ابدأ بتحليل الفريمات الاكبر على الشارت كفريم المنثلي والويكلي وعلى مدى سنوات ... ان تحليلك للشارت على الفريمات الاكبر وبتغطيتك لمدة زمنيه اطول (عدة سنوات مثلا) يزودك برؤية افضل و منظور ابعد طويل الاجل للسوق ... ومن بعدها ابدأ بالتحليل على الفريمات الاصغر . حيث ان التحليل فقط باستخدام الفريمات الصغيرة جدا قد يعطيك نتيجه خادعه ورؤيتك للفريمات الاكبر ستحسن من ادائك . يجب ان تلاحظ الاتجاه وتتحرك معه : اتبع اتجاه السوق بعد ان تلاحظه حيث ان اتجاه السوق يأتي بمقاسات متعددة (طويلة الاجل, متوسطه , وقصيرة الاجل) حدد المدة الزمنيه التي تستهدفها اولا ومن ثم استخدم الفريم المناسب لك ... تأكد بأنك تتداول بذلك الاتجاه (اي اتجاه السوق) . اذا كنت تستهدف مدة زمنيه متوسطة المدى (سوينق) فعليك بالشارت الاسبوعي (فريم الويكلي) والشارت اليومي (فريم الديلي) ...... اما اذا كنت تستهدف مدة زمنيه اقل فعليك بالفريمات الاقل (60, 30, 15, 10, 5) وفي كل الاحوال دع الفريم الاكبر يحدد الاتجاه ومن ثم استخدم الفريمات الاقل لضبط عملية التداول. 3. يجب ان توجد قمة الاتجاه وقاعه : وذلك بتحديد مستويات الدعم والمقاومه , حيث ان افضل وقت للشراء هو عند مستوى قريب من مستوى الدعم وافضل وقت للبيع هو عند مستوى قريب من مستوى المقاومه . 4. يجب ان تعرف الى اي مدى عليك ان تتراجع : قس التراجعات المئويه (فيبوناشي) عادة تكون حركات السوق او تصحيحاته سواء الى اعلى او الى اسفل مرتبطه بنسب معينه (وهي نسب الفيبوناشي) للحركات السابقه للسوق . 5. ارسم خطوط الاتجاه : وهي من الادوات المؤثرة حيث انها تتطلب المرور بقمتين او قاعين على الاقل وغالبا مايكون كسر خطوط الاتجاه (الترند) اشارة على تغير الاتجاه ... اذا كان لخط الاتجاه او الترند ثلاث قيعان اوثلاث قمم فأكثر فهو خط اتجاه مؤكد .. وكلما اختبر هذا الخط اكثر كلما زادت اهميته . 6. اتبع المتوسطات : تعطيك المتوسطات المتحركه moving averages اشارات البيع والشراء , فهي تخبرك ان كان الاتجاه (اي اتجاه السوق او السهم) مازال قائما ام لا , كما انها تساعدك على معرفة الاشارات المؤكدة لتغيير الاتجاه . لا تخبرك المتوسطات مقدما بما سيحدث لكنها اشارات مؤكدة للاتجاه . ان مزج متوسطين معا في شارت واحد هي من اكثر الدراسات الفنية شعبية مثل : ( متوسط 4 مع متوسط 9 - متوسط 9 مع متوسط 18 – ومتوسط 5 مع متوسط 20 ) وهي تعطيك اشارة الشراء بتقاطع المتوسط الصغير للكبير صعودا , كما انها تعطيك اشارة ايجابيه اذا كان سعر السهم (او قيمة المؤشر) فوق متوسط 40 يوم , وبما ان المتوسطات مؤشرات لاحقه للاتجاه فهي تعمل بشكل افضل حين يكون مؤشر السوق او السهم ذو اتجاه محدد وواضح . ترند ام لا؟ : هنالك مؤشرات تساعدك في معرفة ما اذا كان المؤشر او السهم في اتجاه واضح (ترند) ام لا , كما انها تقيس قوة الترند ... لذلك يجب ان تعرف كيف تفرق بين الاتجاه الواضح والغير واضح . مؤشر ADX يساعدك على ذلك .... اذا كان خط ADX (الخط الاسود) صاعدا فهذا يعطيك دلالة ان السهم في اتجاه واضح (ترند) وهنا تستطيع استخدام المتوسطات (moving averages) لتعطيك فعالية اكبر ...... اما اذا كان خط ADX في اتجاه النزول نستنتج ان السهم في حالة تذبذب او تماسك وفي هذه الحاله نستخدم مؤشرات ذبذبات المسار Stochastics & RSI حيث ان فعاليتها في حالة التذبذب اكبر . هكذا يعرف المتداول اي المؤشرات يستخدم حسب نموذج السهم او مؤشر السوق . يجب ان تعرف العلامات المؤكدة : كمية التداول (volume) من أشهر العلامات المؤكدة ... فحين يكون السوق او السهم في اتجاه تصاعدي (ترند صاعد) سترى ان كمية التداول تكون عاليه عند قمم الترند . 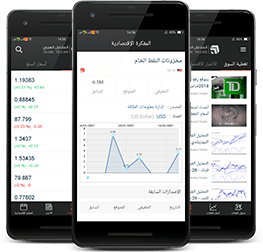 كما ان متابعة كمية التداول في الأسواق المستقبليه (futures markets) وفي البري ماركت مهمه , فهي تعطي دلالات على حالة السوق او السهم .